Only 90 minutes from New York City with easy access to other key metropolitan markets via major roadways including Interstate 84 and US Route 6 and 209. Pike County boasts an economy featuring health care, hospitality, real estate and many other business sectors. Pike County is located in the Pocono Mountains with its abundant natural resources that attract numerous visitors. Pike County enjoys a considerable tourism related business base with resorts and hospitality related enterprises. One major attraction is the Grey Towers National Historic Site. Today, Grey Towers serves as a conservation, education and leadership center with programs that interpret the lives of the Pinchot Family; a prominent environmentalist and former governor of PA.
Pike County is a gateway to Northeastern Pennsylvania from I-84. Recent economic development efforts have focused on the attraction of value added businesses that meet Pike County’s high environmental standards. Several businesses have recently made investments in Pike County offering considerable new employment opportunities. Pike County has targeted several business sectors including fabricated metals, instrumentation, machine tools, etc. in their marketing efforts. 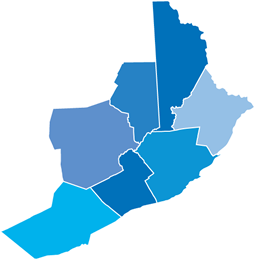 Pike County is part of the New York – Newark – Jersey City NY – NJ – PA Metropolitan Statistical Area. Pike County has been ranked as the fastest growing county in Pennsylvania in terms of population percentage growth. In 1980; its population stood at 18,271. By 2012, the population had increased to 56,758. 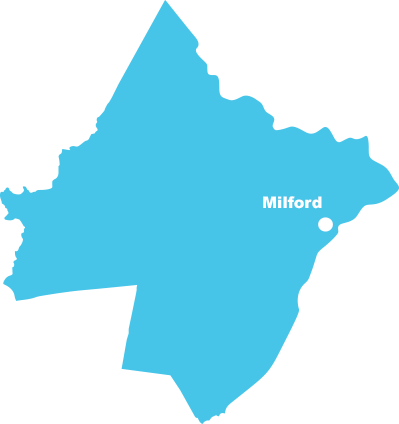 Major commercial centers in Pike County include the Boroughs of Milford and Matamoras.